Churches may disappoint you because churches are not perfect. Religion may disappoint you because religion is not perfect. Jesus will NEVER disappoint you because JESUS IS PERFECT! April 19th – Good Friday: 7:00 p.m.
April 21st – Easter Sunday: Son Rise Service 6:30 a.m. and Worship Service 11:30 a.m.
Sunday at 12:00 p.m. and Wednesday 7:00 p.m.
Come as you are! There is no dress code here at the cathedral. You will find everything from blue jeans and T-shirts to suit and tie. Pastor Diamond has recently been teaching on the Kingdom of God. These sermons have been informative, inspirational and most life-changing. Please feel free to access these teachings on our Facebook page. If you do not have Facebook, you can also access Rev. Diamond’s Sermons on Vimeo. Many people are looking for the same things in a church! They want a church that they don’t just go to, but where they can grow into the man or woman God created them to be. They want a church that is intimate enough that you do not get lost in the crowd, but big enough that it can reach around the world. 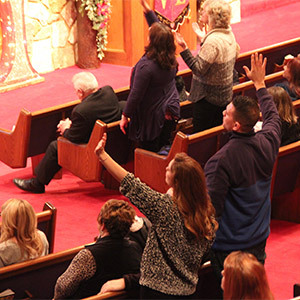 Please consider visiting Diamond Hill Cathedral, “The Neighborhood Church with Worldwide Outreach.” Diamond Hill Cathedral, the church where everyone is welcome! In these uncertain times we need to be certain of something or perhaps someone. You can be certain of the fact that God is still alive. 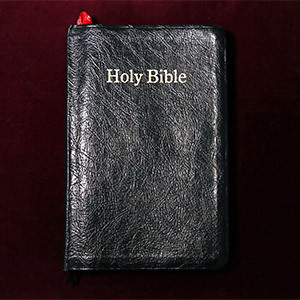 You can be certain that His Word is up to date and is very relevant for your life and the world today. You can be certain that Jesus has never lost his power. You can be certain that you are loved. Mansfield became a city on June 11, 1808. Before the turn of the century Mansfield was known as “the City of Churches.” The city, as well as the significance of this slogan, grew in the following years. Mansfield became a very popular destination stop among the circuit riders within a few years of its founding. One circuit rider in particular, who was very prominent in shaping the Christian history of Mansfield, was Harry O. Sheldon. Rev. Harry O. Sheldon, a Methodist circuit rider, preached throughout the young city. He loved to preach mostly in the Tingley schoolhouse known as “Excelsior Hall.” As many preachers of the day, he frequently conducted services there. In time, the Tingley area was known for religious activity. It is reported that people came from far and wide to hear this powerful, fiery, and effective preaching. Over 2,000 soldiers were trained on the Tingley farm area to set captives free. Over 200 years later, God Himself has preserved the rich Christian heritage of this land. Our Pastor, Richard Diamond, and his four associate pastors are also known for their powerful preaching and effective teaching in services conducted at Diamond Hill Cathedral. This land is also home to BibleWalk, Ohio’s only life-size wax museum and “Dinner With Grace,” Ohio’s only Christian Dinner Theater. Through Diamond Hill Cathedral, BibleWalk, and Dinner With Grace captives are still being set free. After ten years of faithful service at Faith Revivals God greatly rewarded Rev. and Mrs. Diamond and their congregation as they moved to Diamond Hill Chapel in the middle of twenty beautiful acres on Tingley Ave. The church was later re-named Diamond Hill Cathedral. 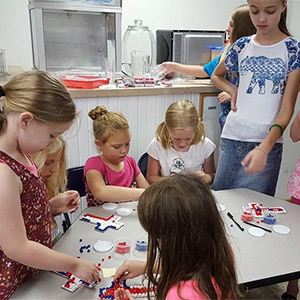 The congregation of Diamond Hill Cathedral proves to stay very busy in their outreaches to the community. Diamond Hill Cathedral is a non-denominational church where everyone is welcome. You can find us on Facebook and join us in one of our services. If you have any questions about our ministry or have a prayer request please feel free to call us at 1-800-222-0139 Mon thru Fri 8:00 until 5:00. How did the church get its name? or Why did you name the church after the Pastor? Rev. 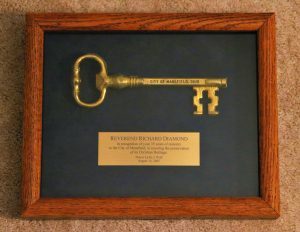 Diamond’s original church was named Faith Revivals. Faith Revivals held its first service August 13, 1970. In a very few years Rev. Diamond, his wife Alwilda, and the congregation knew it was time to look for a larger facility. For a brief time the Sunday Services were moved to Madison Theater, a downtown movie theater. Although this provided a temporary solution, it was not the permanent solution the Lord had in mind. In 1980 Rev. Diamond was one of many local ministers that were contacted by a large church on the east side of Mansfield which was for sale. The name of the church was Diamond Hill Chapel. Through a series of miraculous events Rev. 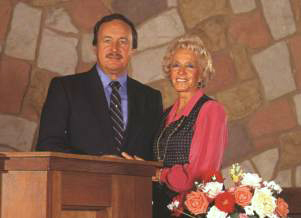 Diamond was able to purchase Diamond Hill Chapel in 1980. His first thought was to change the name Diamond Hill Chapel to Faith Revivals, the original church name. But the Lord showed him due to his faithfulness, and that of his wife and their congregation for the first ten years of the ministry, the name was part of a continuing testimony. That is how the church was named and the answer is No, it was not named after the Pastor. The odds of one man buying a church that already possesses his name is insurmountable. The only change was Rev. Diamond and his wife decided to re-name it from Diamond Hill Chapel to Diamond Hill Cathedral due to its beauty.